The public OpenSim grids added more than 4,000 new regions this month, registered more than 4,400 new users, and grew by 735 new active users after maintenance and other outages depressed the numbers last month. The graph below shows the land area growth of OpenSim’s public grids from June 2010 up to October 2016 in region equivalents. As you can see there have been some noticeable drops in regions in recent years. The trend continues to be on the up for OpenSim grids at the moment and it will be interesting to see what impact Sansar will have on the OpenSim numbers during 2017 when it opens to the public. 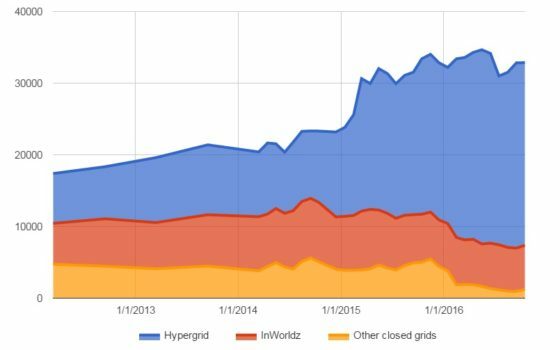 The hypergrid has continued to grow in recent months and years with more communities joining and more muiti-grid events happening every month. Active users on the Hypergrid has increased a lot during the past year or so. Many OpenSim grids will be hosting Halloween themed events, hunts, parties and destinations this year. There are over 200 Halloween items on the Kitely Market to check out this year. At the moment the Kitely Market offers 8,205+ products and every month more items are being added. 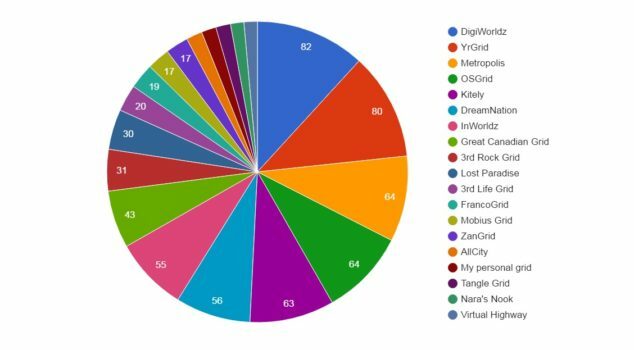 Almost 800 responses were recorded in the Seventh Annual OpenSim Grid Survey where “DigiWorldz came out with the most responses, while AllCity received the highest scores, followed by FrancoGrid, Virtual Highway, DigiWorldz and Lost Paradise“. This graph shows the total number of responses for each grid from the Seventh Annual OpenSim Grid Survey. 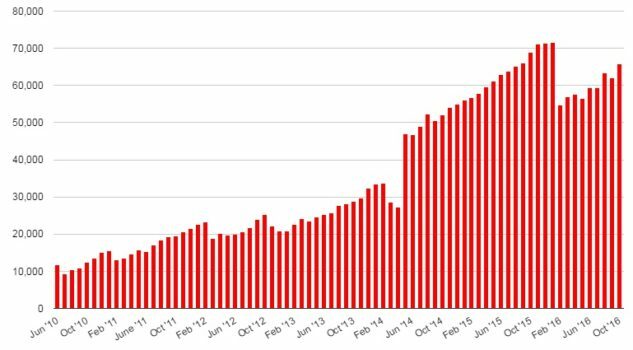 OpenSim grids have increased in land size, active users and in new users during the course of 2016 so far which is good to see happening. At the moment OpenSim grids have three times the regions than the Second Life main grid does. There are over 64, 000+ regions on OpenSim compared with Second Life just over the 24, 000 regions mark. There have been various OpenSim grids that have had outrages and cleanups during 2016 which has had a noticeable impact on the grid numbers. Every week there has been a decline in regions in Second Life with only a handful of weeks being positive growth during the course of 2016 so far. Looking ahead to 2017 I think it’s going to be an interesting year for both OpenSim grids and Second Life with the launch of Sansar going public and VR becoming more popular than ever before. I wonder if this impact will have any the grid numbers on OpenSim and Second Life in 2017-2018 ? It would be really good to see more growth in terms of regions and active users in Second Life during 2017-2018. I think that in 2017 OpenSim grids will grow even more with the hypergrid becoming a large grid. Stay updated on the latest OpenSim news via Hypergrid Business.